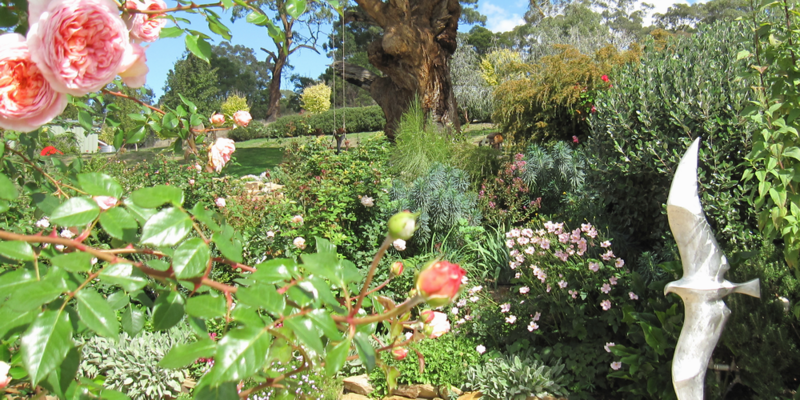 Mica Grange Garden is one of Australia's leading country gardens having appeared in the Australian Country magazine's special gardens edition in 2014 and for its Sculptures in 2015. 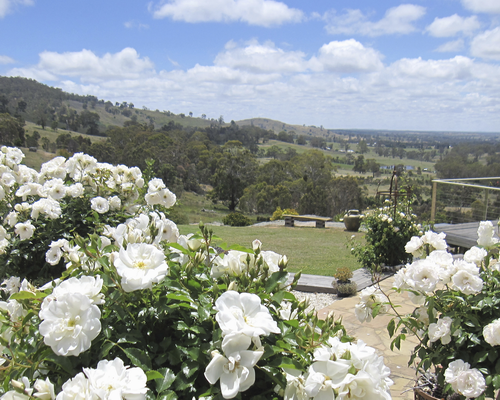 Located just 80 minutes from Melbourne CBD at the foothills of Mount Alexander with stunning views across the Sutton Grange valley, it is the perfect location to relax and enjoy both garden and art. The 3 acre garden opens for 5 weekends each autumn and spring with a new sculpture exhibition. Entry $6 per adult. Morning/afternoon tea, lunch, garden art, plants, preserves from organic vegetable garden available.The garden is also open year round to group bookings by appointment with morning/afternoon teas and lunch being available. Annual Rainfall avg: 697mm. Summer avg. 116mm. No. of rainy days: 40 Winter avg. 223mm. I have visited this garden several times and am never disappointed. The rose archway is magnificent and the variety of plants in the expansive garden bed that follows the contours of the house is wonderful. The garden is open around April and October/November and my friend and I make time to visit in both seasons. You can have lunch ir afternoon tea on the deck but we prefer to take a picnic and find a bench (there are many) or a large rock to sit. Also, we rarely leave without a 'garden art' memento...there is lots of variety to fit any purse! We visited Mica Grange last weekend. Warm reception from owners & staff. The sculptures complimented the garden well & were distinctive. The garden blended beautifully with the countryside and conditions. The catering was lovely. A very worthwhile visit.